Construction, Dissection and Programmation - Computational Creatures 1.2 — Wonderful Idea Co. It was a super fun and busy second day at our computational creatures summer camp! We had three projects that will connect in interesting ways as we begin to move into creating more in-depth computational tinkering projects. In the morning we experimented with building cardboard automata using a starting point developed by our friends at Fire the Inventor and Cabaret Mechanical Theater. Tinkereres spent a little bit of time observing the examples but quickly moved to imagining their own designs. 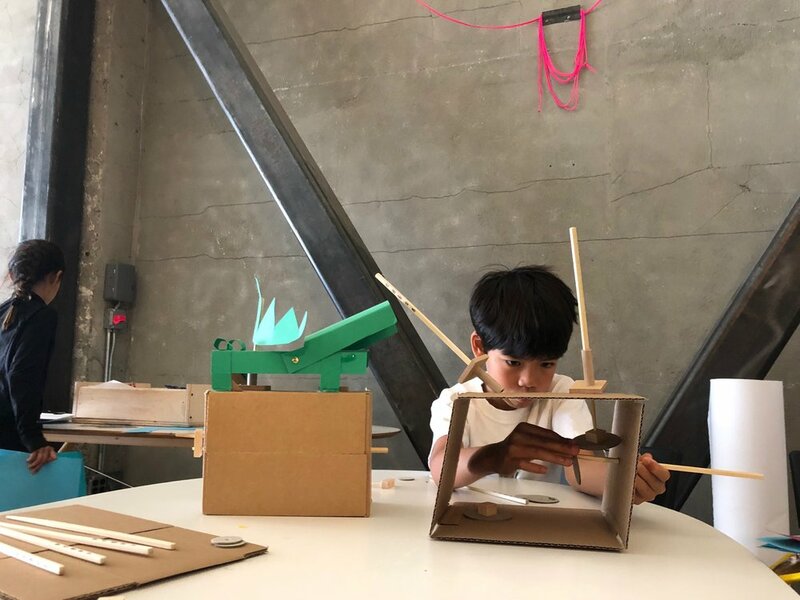 This activity will provide some background for developing motions and mechanisms as well as simple cardboard construction techniques that we'll return to over the course of the week. In the afternoon we moved to the excitement of carefully dissecting singing and dancing toys. Campers drew their toy, labeled the parts that they could see, feel and hear (as well as what they imagined inside) and started to dissect each one in pairs. There were lots of silly moments, careful tools use and fascinating discoveries. Many of the groups uncovered motors, speakers, LED lights and circuit boards which are the same basic building blocks that well be using later in the week to create our own designs. Each group also got the chance to start experimenting with microbit and makecode (the programming hardware and software that we're focusing on for the week). Most of the campers had experience with scratch programming before, but it still was a challenge to use the block-based coding to control real world objects. At the end of the day we wrote in our journals and imagined what we might create using some of the parts that we discovered inside the toys and how we might use microbit to control these elements. Stay tuned over the next three days to see how these ideas develop!